Things didn't go so well for Ventura Sports in El Paso. The company tried to work with the city, including paying for park improvements, but according to Mr. Schuster, El Paso wanted to maintain "100 percent local ownership." A former owner of the El Paso Diablos offers his two cents on the matter. "They've got to pay debts that have been acquired, they've got to bring the ballpark back up to standards required by the City of El Paso, and they need the money to improve the ballpark. People have quit going because the ballpark has gone to hell." So it wasn't just a matter of improvements, and ownership in El Paso, but debts as well. 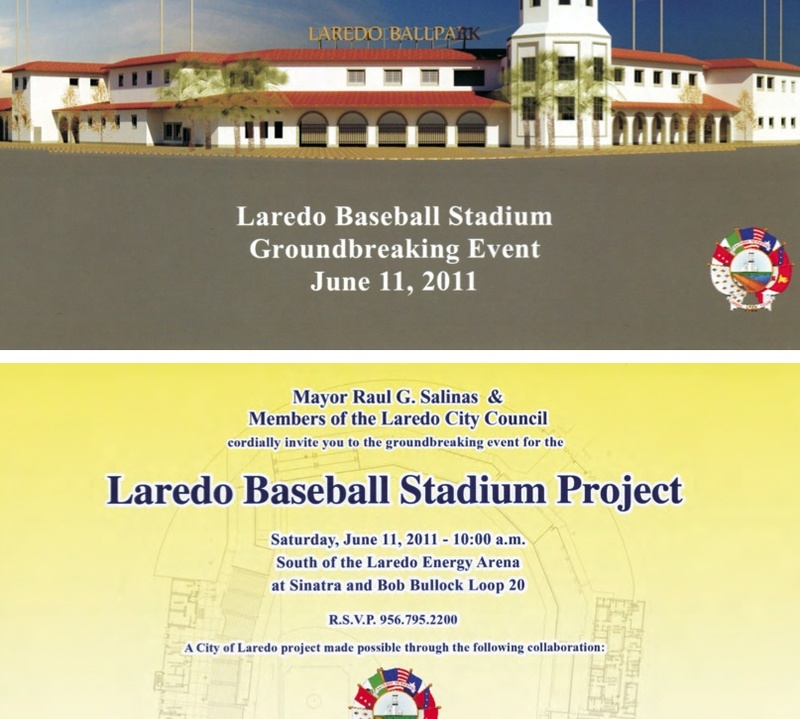 Thankfully, Ventura won't have to worry about park improvements here in Laredo because they're getting a brand spanking new baseball stadium. Whether they can make it a success is yet to be seen. Here's our mayor at the recent ground-breaking ceremony for the stadium near the Laredo Energy Arena. 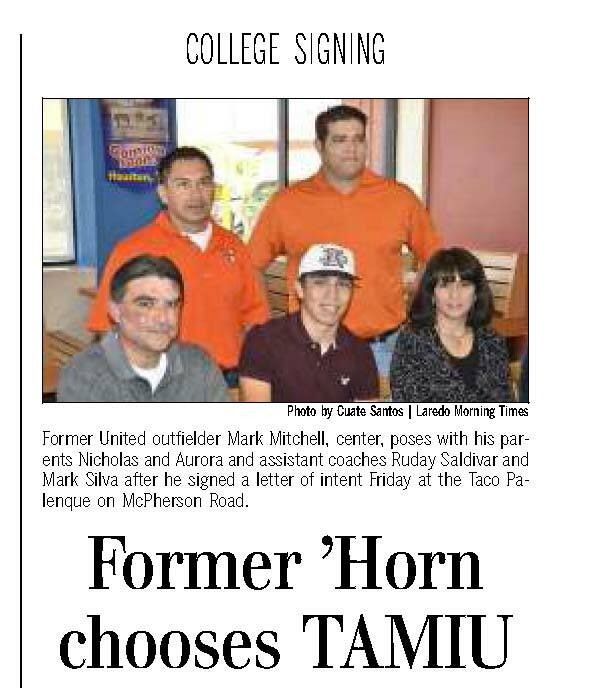 The LMT story above appeared in yesterday's paper. I have been following the Casey Anthony murder trial. TruTV and HLN have me glued to my television any chance I get. Today in the month-long trial the Defense rested its case, but it is still far from over. With all the sidebars and recesses in this trial, there was an additional distraction in court today. A courtroom observer, Matthew Bartlett, was found in contempt of court for flipping the bird at one of the prosecutors. LOL, actually uh, not funny your Honor! He was presented with a photo of his gesture and asked to explain his actions. He was eventually handcuffed and sentenced to 6 days in Orange County jail along with a $400 fine plus court costs, which he can pay over a six-month period. Ouch! 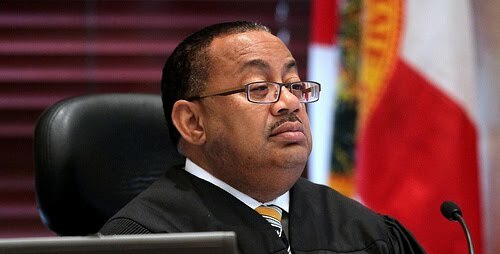 The judge made it clear that he will not tolerate any nonsense! Update: It was brought to my attention that a previous contempt of court charge had occurred during the jury selection phase of this trial. See the much more dramatic video below! The business community should be more vocal about the need for immigration reform. It's interesting that when I criticize energy companies for drilling practices (fracking), I'm called anti-business. But when somebody speaks against undocumented immigrants, they're not called anti-capitalist. Businesses across the country depend on the immigrant workforce. What part of that don't nativists understand? Here's a letter that appears in today's LMT's editorial page. It was sent in by Eva Ramirez. I recently heard the announcement of a permanent homeless facility that will be housed at the former women’s shelter in west Laredo. Our political leaders are trying to present this project as a proactive measure to reduce crime and drug use. Unfortunately, residents were not informed of such plans. As a resident of this area, I am outraged that this location was chosen. 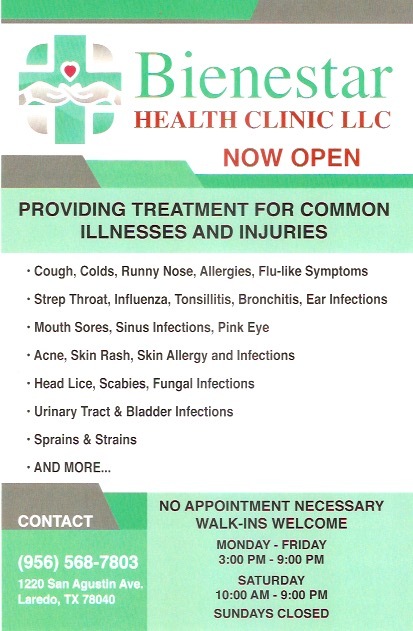 This facility is located in a residential area, across the street from a church and a block away from an LISD elementary school! In addition to safety, other issues concern me. Individuals with substance dependency or mental issues will be this facility’s primary residents. I ask my neighbors to petition our city councilwoman, Cindy Liendo Espinoza, and our county commissioner, Jaime Canales, to look for another location to house this project. 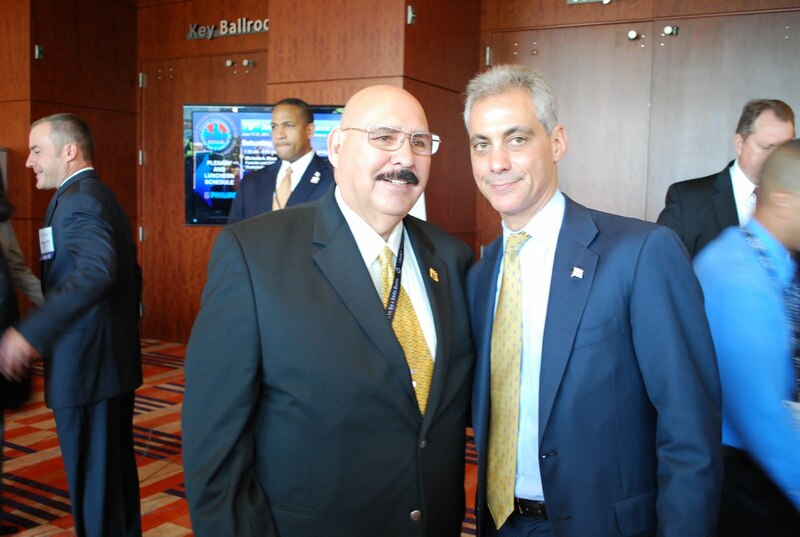 Our city and county leaders talk about transparency. Where is the transparency here? I surely didn’t see this coming. I was pleased to hear the news of another homeless shelter offering services to the community. But in reading Ms. Ramirez' letter, I can see how people would have concerns. Our leaders need to step up some more to let us know what's going on in our area. If they can make it to the countless photo ops, ribbon cuttings, holiday celebrations, pachangas, etc, then they can make time for monthly town hall meetings. And I don't mean town hall meetings where department heads do all the talking; I mean town hall meetings where councilmembers, commissioners, and representatives actually take questions from the public, even if there are only two people present. Odie Arambula (LMT) focused today's "Monday Wash" on a recent Supreme Court ruling that speaks to conflicts of interest within governmental entities. Mr. Arambula lamented the fact that the court's ruling probably didn't register on our local officials' radar, even though conflicts of interest have affected everyone from our school boards to county and city govenment. I don't even want to get into the doings of our state and federal officials since the stakes are surely much higher. Here's a little background, courtesy of the wash writer, on the case that led to the Supreme Court 9-0 vote. It seems that in the town of Sparks, Nev., a city alderman was censured by the Nevada Commission on Ethics for voting in favor of a hotel-casino project backed by the official’s campaign manager. The commission ruled that the alderman should have abstained as provided by state ethics law. On that score, dear friends, we would do well to pay more attention to the public bodies — City Council, Commissioners Court, commissions, committees, boards, etc. — that post long meeting agendas wherein items are approved on a motion and a second with little or no discussion. For some reason, yesterday I got to thinking about the money spent by those who seek local office. Their expense reports have detailed spending in the tens of thousands, if not more. I stop and wonder how these new campaign debts fit in with their usual mortgages, car payments, etc. That money has to come from somewhere; And I think that's where the conflicts of interest come in. The local blogosphere has discussed, to some extent, the relationship between governing bodies and local contractors. 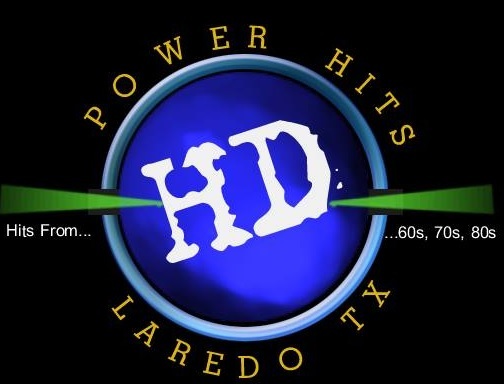 Wake Up Laredo recently talked about a contract awarded to Leyendecker Construction, even though they were bidding higher than other companies, and not even near the top of the recommended list of contractors. Campaign contributions pour in once a candidate decides to run, and certain companies align themselves with the candidate of their choice. Eventually those who end up winning will have to return the favor. A vote to award a contract to a campaign supporter definitely looks like a conflict of interest, but will it even be taken into account by our elected officials? 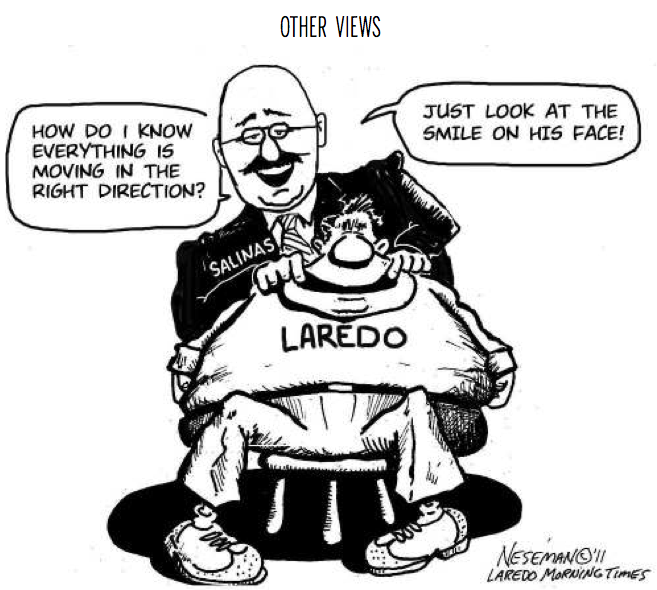 With Laredo's size and small pool of influential people, it looks like conflicts of interest will exist at every turn. Paying more attention to the machinations of our political insiders, as Mr. Arambula suggests, may prove to be difficult. I was walking back to my car after making a purchase at Target, and I came upon these trashed shoes on a parking space. 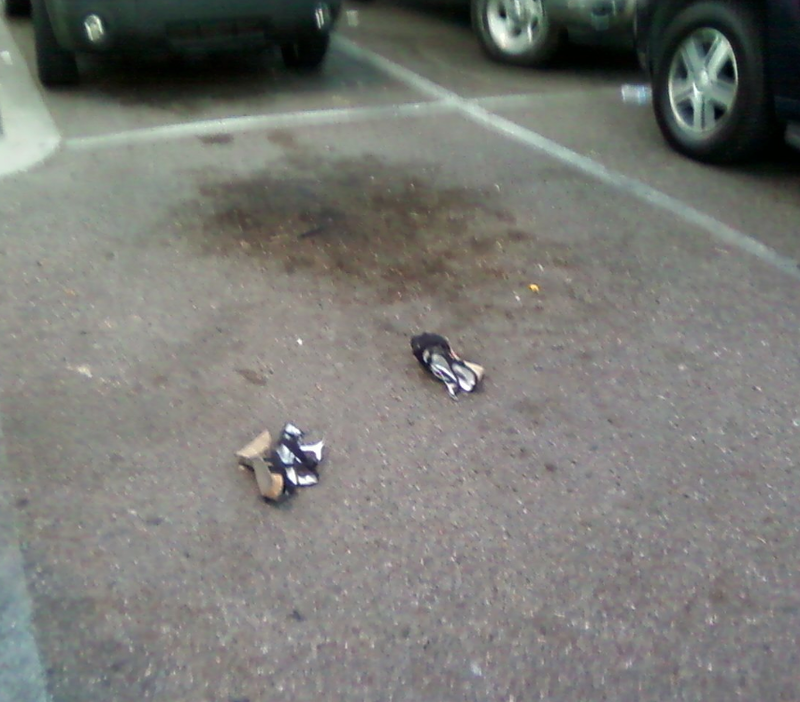 For a minute I thought the Rapture was upon us afterall. But then again the shoes were probably uncomfortable aside from being ugly, so the decision was made to get rid of them. You can't be concerned with littering when it comes to fashion. 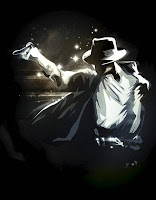 The King of Pop Michael Jackson died 2 years ago today. Is it one of those moments in time where you remember where you were when you heard the news of his death? It is for me. His music had always been around. Little did we know how sad his life really was. When you think of all he still had to offer, it just makes his loss more significant. No matter what you thought of him or what personal ordeals he went through, there is no denying his musical talent and contributions. The trial for the doctor accused of administering the dose of Propofol that ended up killing Jackson is scheduled to begin this September. My favorite performance at Michael Jackson's memorial service: Two very moving songs performed by Stevie Wonder. This photo was taken yesterday around 7:00 pm on San Dario Avenue, downtown area. So much for the conservation of water. Maybe it was a way to celebrate the rain we received just the day before. It's a lazy Friday. I was thinking of crossing the bridge and going to that city-which-shall-not-be named (i.e. Nuevo Laredo) for some shopping and some adult beverages. But, once I read about what is going on, I decided to stay put and enjoy the Gateway City. Bordertown Blues is writing long photoshopped posts again. De Laredo lost his phone. Ooofas! Furniture in Life has now escalated the Laredo blog race to new levels, employing accomplices and multiple computers in ingenious ways. Que Fregados is bringing Laredoans more informative posts. This time about cemeteries. Wake up Laredo has not updated in over three weeks! What up man? 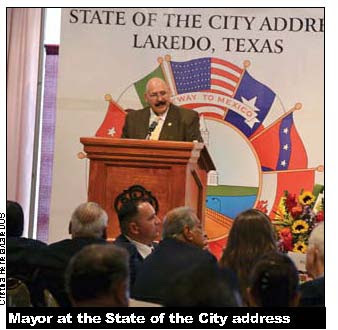 I was checking out the Mayor's State of the City address story in LareDOS when I came to the realization that Salinas' second term is defined by one word: mediocrity. How else could you spin it--unless you work for the Chamber of Commerce? 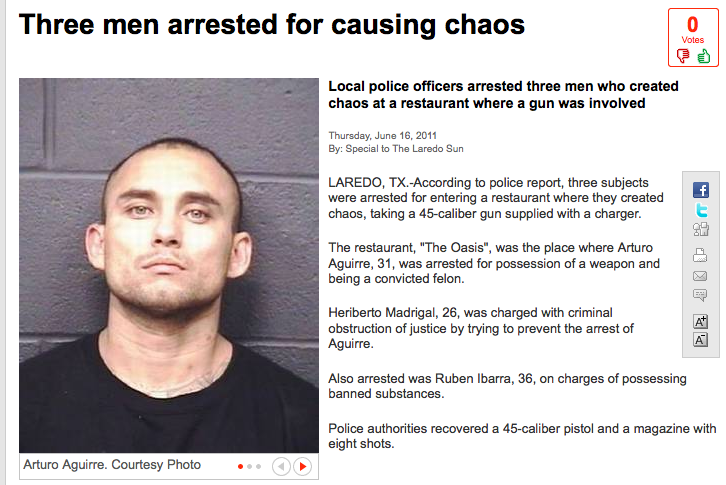 It's all good in Laredo. People are smiling. Jobs are plentiful even though they are of the minimum wage variety. Hell, things are so good you can leave your car out with the keys inside and no one will dare steal it. Its Xanadu. By the way, nice Rebel flag behind you, chief. What's the going rate for using popular music in commercials? The two-story home that's located at the corner of Chihuahua and Seymour belongs to George Beckelhymer and his brother. Beckelhymer spoke to city council yesterday about the home's history. He plans to donate the property to the city after it's renovated; The grounds will also be landscaped. The public will eventually be able to tour the site. Also at yesterday's meeting, Councilwoman Liendo brought up "Arte en la Avenida." Critters and Crayons has a post on it. As Texas grapples with water level decreases, restrictions on usage are implemented. But in Laredo there are loopholes. When the city released the residential watering schedule (see the last bullet point in picture above), I thought it was for any and all exterior water use. But as you can see by tip #7, a person can water any time and any day, except Sunday, as long as one uses a hand-held watering device. So you can have a St. Agustine lawn and water it in the middle of the day as long as you stand there and saturate it to your heart's content. All you need is the patience to stand in the oppressive heat while you physically water the lawn. 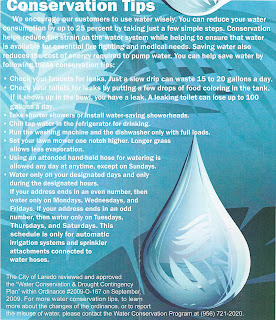 I really don't see the point of having a Water Conservation Program if watering is going to be allowed any time. Most people in the Chacon barrio don't have lush gardens, but that has more to do with economics than anything. That still doesn't mean that you won't see a green lawn in the hood. The city needs to do more to promote xeriscaping. And while they're at it, they need to stop sending out brochures that'll end up in the trash. Pro8news reported earlier today of a burglar in his 20s assaulting a 70-year-old woman while trying to steal her purse. The lady had groceries in hand as well. She reportedly struck the robber with several eggs. The perpetrator got away with $600. A sad day for the elderly lady. 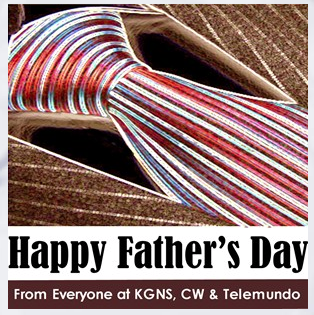 But kudos to the graphics staff at KGNS. So, change is good. 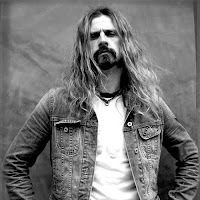 Take for example, Rob Zombie (who seems to like cemeteries by the way!). He started the rock/metal band White Zombie in the late 80's, and they had a huge hit "Thunder Kiss '65" in 1992, among others. The band split up after a few albums, then Rob went solo. Rob directed most of his band's music videos, and his interest in horror films led him to become a movie director of the genre. He even directed an L.A. based episode of CSI: Miami! Now Rob's talents have been utilized for a very unique commercial for, of all things, Woolite! I guess after taking on this job, Rob will be ready for his "Hell on Earth" Tour with Slayer next month. Cheers to change! Screen shot from the LMT. We don't need a lake where fisherman catch giant fish. We'll soon have a new golf course and baseball stadium. 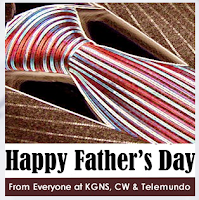 On the KGNS site yesterday, I noticed a Father's Day greeting from staff. That's cool and all, but the picture makes me think of somebody laying in a coffin. The Texas Council on Cardiovascular Disease and Stroke recently presented city staff with a gold level recognition for their work at promoting a healthy lifestyle. They got a plaque and everything. Naturally, the mayor was there to accept the award and say some words. But what I'm about to show you is something quite peculiar. Here's the mayor starting off (in this video, at least) by recounting an experience he had during an ambulance ride: A paramedic tried to start an IV on him; He tried eight times. Let's run it down, shall we? He decides to tell what he thinks is a funny story. He thanks those who make up the partnership. He throws in a mention of him missing a council meeting the day before. He says that people see him coming and utter, "Ay viene el gordito." He mentions one of his pet peeves at the four minute mark. Education system is ranked low in Texas. "No tengo pelos en la lengua." At the seven minute mark, he complains that people don't go out to vote. Proceeds to speak away from the podium. I don't want to say that the mayor suffers from Attention Deficit Disorder, or experiences 'flight of ideas' because the job of diagnosing is better left up to a doctor. Instead I'll just say that his rambling is due to being ill prepared for speaking engagements. He was hospitalized the day before, but saw that it was too important to attend this event. Unfortunately he didn't practice his speech, or so it looks like. This man has been winging it for so long that it's not funny anymore. When the camera pans back, I just see the crowd sitting quietly, probably stunned by the mayor's words. All I can say is that I'm glad I wasn't there. 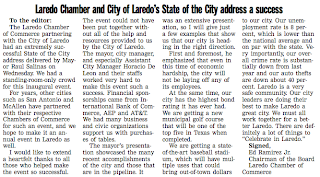 Apparently the mayor isn't the only one who speaks highly of Laredo. Here's an entry to today's LMT Editorial page. Celebrate, people. Things haven't been better. Hmm. I'm obviously hanging out with the wrong crowd because I don't hear that motto on a regular basis. The ad pictured above appeared in the "Parade of Homes" brochure. Jorge Vera takes the race for City Council District VII. Will update this post shortly. I don't know if it's me but the lead in to the race results by Adriana Arce seemed a bit snarky. The ten o'clock newscast was the first I heard about any results. Why didn't she just say who won from the beginning instead of having us hang on every word she said? Anyway, Vera won. He reports Monday. I spent most of the day checking out the homes on display for this year's "Parade of Homes." I was hoping to get ideas for my patio, but it was only a handful of homes that had your typical outdoor grilling oven with a chimney, ceiling fans, and cushy furniture. For the most part, the backyards had grass and nothing else. I suppose the goal of this event is to present floor plans to people and not so much the landscaping. All the homes were decked out with nice furniture, some of it tacky for my taste. The homes were nice but builders, in some cases, got too adventurous with their designs that it took away from the overall look of the home. In one case, a staff member tried to turn on a water feature, where water was supposed to stream down a glass divider between the entryway and the living room. He pressed several buttons but nothing happened. And I think that's one thing I took away from the showcase: they try to impress you with fancy upgrades, but they end up falling flat. Anyway, the picture I've included above is that of a home that had a plain plastic trash can near the living room. Nobody was allowed to take food or drinks into the homes, and out of the ten or so homes we saw, water was offered to us at one site, so I don't know why they had the receptacle out in full display. But I think it speaks to the significance of the experience. Here you had all these expensive homes with a minimum of 2,000 sq. feet apiece, and in the middle of it all was this ordinary kitchen fixture. It was out of its element somehow, just like most of the 'parade' attendees. Now, I'll admit that those homes were out of my price range. I make a good living, but I'm not about to go out and buy a $300,000 home. There's too much upkeep to worry about and I would definitely have to get a second job. It would be nice to live in one of those homes if I wasn't so much of a Joe Lunchpail type of guy. 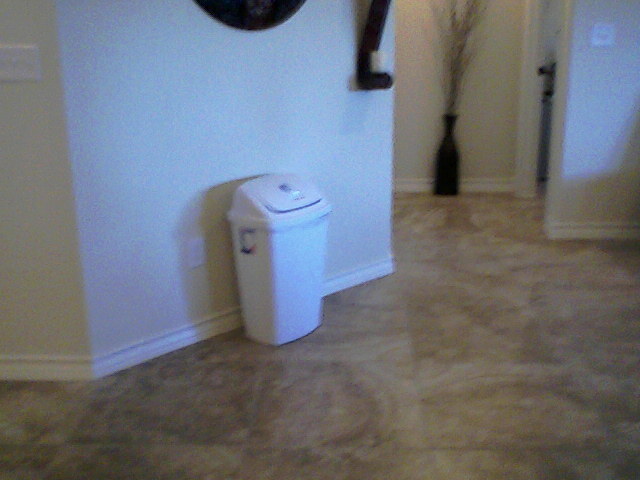 I felt like that little trash can -- out of place. That's probably why I live in the Chacon. But I got the sense that most of the people who were out to see the homes were also in a league not their own. I can safely say that the house that had six bathrooms was not in anybody's price range. Nevertheless we all went in out of curiosity. That, mostly, was what got us out of bed this morning. Tomorrow, Mayor Salinas will participate in committee meetings to consider policy resolutions. 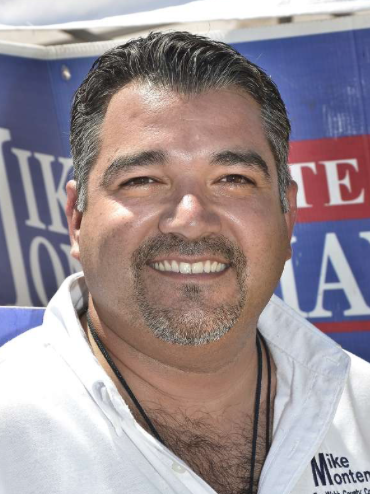 Two of the resolutions were authored by Mayors Salinas. One speaks to the need for a comprehensive and compassionate immigration reform. The second, co-sponsored with New York Mayor Michael Bloomberg, calls on the Federal Communications Commission to respect cities’ authority to collect reasonable fees from telecommunications providers that use public assets. On Sunday, Mayor Salinas will chair the Conference of Mayor’s Immigration Task Force at which ICE Director Morton is a presenter. 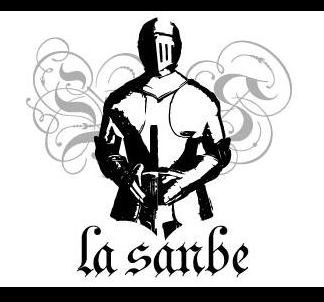 He makes notice that LaSanbe is already two years old, but actually, this coming September we'll be four. Good times. Songs get covered by artists all the time, even if they belong in totally different genres. However, I don't know if Axl Rose ever imagined his melody being used in the classical realm, much less commercials for dance apparel stores. District VII will have a new council member tomorrow night. We'll be sure to keep up with the details. I don't know if I have any readers in District VII, or if anybody really cares about this race, but the issues should be the same as in other parts of the city: infrastructure, quality of life, jobs, etc. For this entry of 'Menso, Not Mensa,' we get an extra dose of dumb. Three individuals entered a restaurant and "created chaos." I pause for a minute to ponder the group's state of mind prior to heading out to the eatery. Dude, you have a prior conviction. Do you have your gun ready? Check! Dude, do you have your drugs handy? Check! OK, if things go wrong, I'll take on the cops. Now let's go! I've never been to one of these 'Parade of Homes' events, and I think it has something to do with me not being drawn in by granite countertops, upstairs game rooms, and Cantera columns. Most of the floor plans will surely be in the 2,000+ square foot range. That's too much house for my miserly taste. But I just might head out to see some of these houses this weekend to see how rich people live. What is it like to live at Shiloh Crossing, Lakeside, Khaledi Heights, or Plantation? I have an idea but I should take a look anyway to get a better picture. I'm almost certain that the homes that will be featured will be in the over-$100,000 range. In the back of my head I'll keep in mind that the median household income in town is $38,567. I don't point that out to knock people who buy expensive homes or chose to live in certain parts of town. I do it because it seems like people are offered more than they can handle. 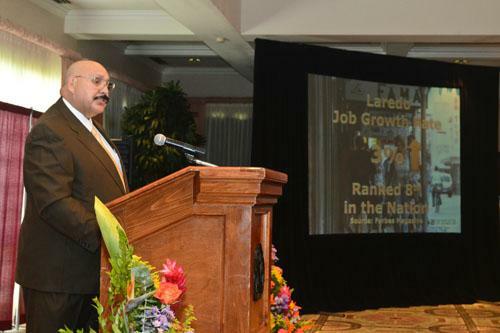 But Salinas said that at 8 percent, Laredo’s unemployment rate is lower than the rates in El Paso (9.7 percent) and the Rio Grande Valley (11.4 percent). KGNS covered the "State of the City Address" yesterday, but for some reason, they don't have the video available for me to post on this here blog. And today, KLDO doesn't even mention anything about the mayor's speech even though they featured a screen grab of a Que Fregados' post last night relating to the fee that was collected for the address. Strange. 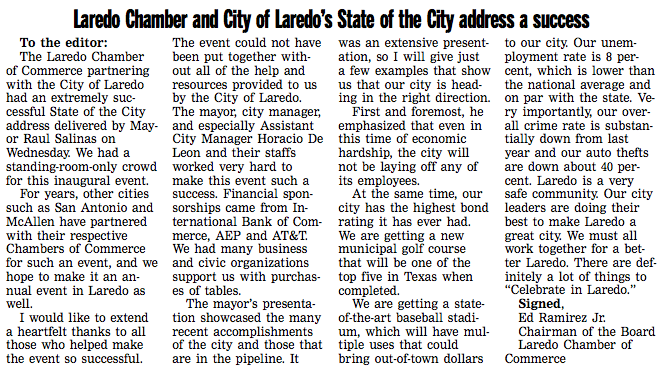 If the KGNS clip was available, I could point out where the mayor cited Laredo's 8 percent unemployment rate (done so above with help from LMT). He proudly commented that Laredo has not had it this good in the past (paraphrasing). Then Miguel Conchas, of the Chamber of Commerce, said that Laredo's unemployment rate in 2008 was 5 percent. LaredoTejas picked up on that little nugget as well. Of course we knew the mayor was going to brag about all the supposed advancements the city has made, such as the funding they got for first responders that was always there to begin with. But for him to be sending out mixed messages to the public is embarrassing. It's obvious that he didn't look at former job statistics. He says something and then Conchas refutes it altogether. Check out this graph from the Bureau of Labor Statistics. It looks like things were better before, as far as Laredo unemployment numbers are concerned. And downtown merchants know this too well as they have seen better days. The downtown crowd was not too pleased with the mayor's presentation. They felt like their needs were not represented in the speech. And that, again, was to be expected. He wasn't going to go out there and talk about the grandiose plan the city has for building a tunnel at the mouth of the bridge 2 terminal and shutting out downtown businesses in the process. He wasn't going to talk about the empty El Portal area. And he wasn't going to talk about the drainage work near the Plaza Theater that affected downtown businesses for weeks. This was a pep talk with a cover charge. I don't have anything against being optimistic, but for gawdsakes man, get your facts straight. Be a little more straightforward with us, especially if people are going to shell out $35 to hear you speak. One thing that I learned from the Anthony Weiner texting scandal is that I need to take my workouts to the next level. Someday, hopefully, I'll have a chiseled chest that I can be proud of. Sometimes I wonder how my social life would be different if I had grown up owning a cell phone. I probably still would've been taunted via text message, but I could've also had a larger circle of friends. I mean, take this blog for instance: I've met people that I would've never met. Technology has its advantages, but abusing it can have destructive consequences. Anthony Weiner is set to resign from Congress. And that's good. Remember him? I do. 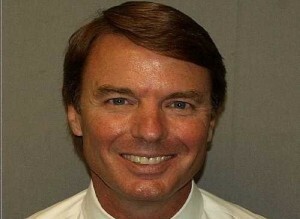 That's John Edwards, and the picture before you is of his mug shot. It's funny because I have a whole 'nother idea of what a mug shot should look like. Some time ago, Tom Delay also smiled before he was deloused, as did Patricia Barrera. 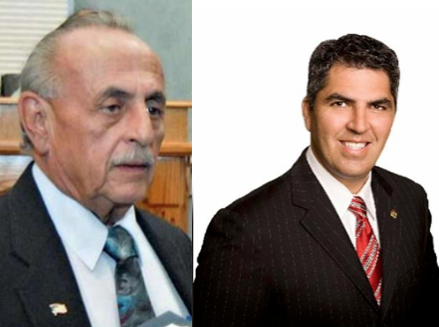 The peculiar thing is that all three were brought up on charges revolving around campaign funds -- Delay and Edwards misused them and Barrera allegedly bullied people to get them. So this leads me to believe that when one is being accused of wrongful conduct, a twisted etiquette is in order: smile for the camera. The only reason I can think of for these people to smile for their mug shots is that they truly believe that they are innocent, and that this whole process is a farce. They have done nothing wrong and it is us who are the real losers. They're coping during booking and it's creepy. And the sad part about it is that they'll just go back to doing whatever it is they do after they go through the appropriate processing. Texas Monthly named Judith Zaffirini as one of Texas' best politicians. Funny. I didn't know she was still in office. 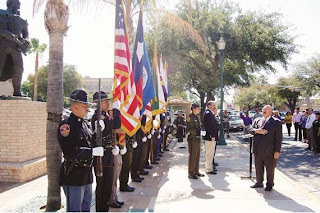 During yesterday's Flag Day ceremonies, Mayor Raul Salinas experiences a slight rumble in his stomach. Newsflash: This just in. 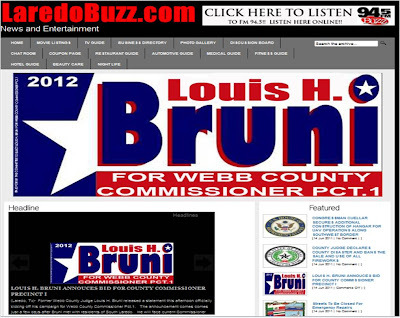 Laredobuzz.com, the longstanding Laredo news website will change its name to LaredoBrunibuzz.com soon. It will be all Bruni all the time from now on. Purely objecive, of course. OK, kidding. Laredobuzz founders are too busy saying "Thank You, Mr. Bruni, for all that you have given us" to actually affect change. The power of money in politics, people. For those of you who will attend the mayor's 'State of the City' event tomorrow morning, good luck. I, however, will wait for the DVD version. But that doesn't mean I won't enjoy any juicy details. Here's a taste of what the event will sound like tomorrow. How can we fret about spillover violence when we contribute to that very same thing? Yesterday I found out that Clarence Clemons (of E Street Band fame) suffered a stroke. And while I run the risk of annoying my wife with any mention of Clemons, Bruce Springsteen, sax music, or 80s pop, I have to send the man a shoutout. My thoughts are with you, Clarence. Peter Gabriel will be in Houston this Thursday. But instead of having his usual backup band helping him out, he's performing with an orchestra. Gabriel has always been known for being dramatic and showy. An orchestra should be a right fit for him; Albeit a tamer production, but dramatic nonetheless. I saw the movie "Super 8" last weekend. It was really good, but I have to say that the use of several 70s hits in the movie was a little self-serving. My thoughts are that it was done so to remind us that the flick was set during the Carter administration. Either that or the producer and director wanted to let us know what they have in their iPods. It's new music Tuesday and the Junior Boys have a new release out. The album is called "It's All True." Some people are really passionate about immigrants coming to this country. As Texas tries to pass legislation that resembles that of Arizona's SB1070, frustrations start to show. Translation: Hispanics have infiltrated the Legislature; They are not welcome. The San Antonio Tea Party president took a different stance. Hispanic liberal legislators are the problem? In Texas?!!!!!!!! Are you effing kidding me, man? If Texas has trouble passing legislation that would target undocumented immigrants it's because people, including legislators, realize what effect it would have on the Tx economy. Businesses rely on the immigrant labor force, not to mention their buying power. 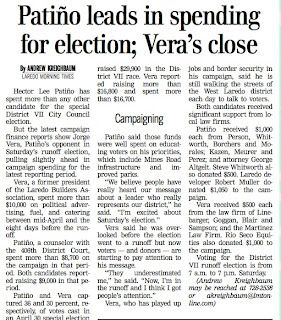 The Laredo Buzz carried a propaganda facade of a story on Louis Bruni campaigning in the South Side of Laredo to garner votes. Of course readers will likely be familiar with Bruni's comical time at the city council and his failed bid to unseat Senator Judith Zaffirini as a Republican candidate. 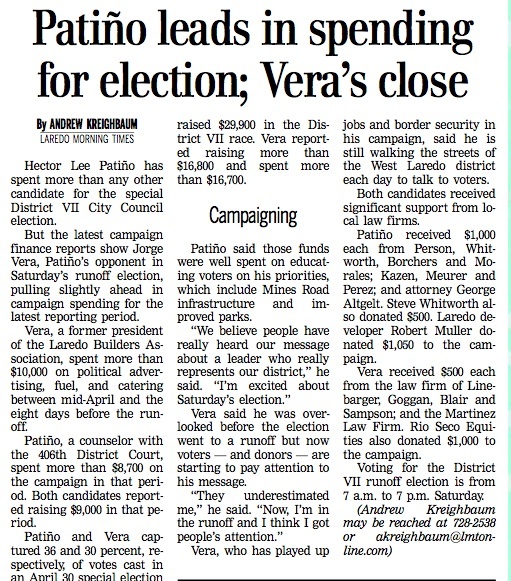 Now, the phoenix dodo bird has risen from the ashes and has reinvented himself as a man of the people to gain the Webb County Commissioner seat held by the incumbent Frank Sciaraffa. Exploring the South Side at ground level and taking informal polls, many non-pachanga voters like those seen in the pics organized by the Bruni camp are a little skeptical about the oil tycoon. Not everyone, of course, but many. What many people are concerned with is Bruni's true empathy with the residents of the South Side considering his wealthy background which contrasts with that of Sciaraffa's (Sciaraffa is a native of the South Side and an alumnus of Cigarroa). Either way, this promises to be a hotly contested race, one which will certainly go down to the wire. We here at La Sanbe are waiting the next round of carne asadas and pachangas. Maybe we'll get invited to one too. If you want to see more, click on Laredo Buzz to see how websites can be bought off influenced by the gleaming shine of jewels and coins. City council meetings can be so insufferable, what with all the mundane proceedings that take place. If the countless recognitions at the outset of the meetings don't get to you, then the gratuitous wisecracks will. And of course, no meeting would be complete without some inconsequential speech from our illustrious emcee mayor. The video below is of the mayor explaining why he was absent from a previous meeting. Nobody asked him to account, but he saw fit to go on about his personal matters. Webb County Commissioners Court will take up a slate of items today to address ongoing issues with payments for weatherization assistance under the Community Action Agency. CAA director Juan Vargas will ask commissioners to create a new position for a quality assurance officer. County Attorney Anna Cavazos Ramirez will provide an update on efforts to recoup funds for weatherization services improperly obtained by county employees. I'm having trouble figuring out which Laredo scandal is the worst of 2011: The case of Abe Martinez blackmailing a couple of doctors, or the rampant nepotism at county that led to the misappropriation of federal funds. In the medical drama, you have a clear cut cast of players. There was the hospital administrator who bled two doctors of cash in return for contract renewals. What role the hospital played is unknown but questions arise, especially after Martinez was reassigned. This all could've occurred under everybody's noses, but knowing how hospitals are hotbeds for gossip, where news travels fast, it's highly unlikely. At Webb County, either people were kept in the dark as to what was going on in the (CAA) department, or a sense of invincibility, along with a helping of incompetence, exists. Apparently no checks and balances were in position since employees were qualifying themselves for assistance to weatherize their homes. And now the CAA director wants a quality assurance officer installed. From what we have read in news reports, it looks like there was nobody minding the store. Nobody ever said anything and word never went up to the top. At least in the bribery case, somebody is looking at jail time. At county, officials are looking to recover lost funds but nobody's brought up the issue of criminal charges against those who helped themselves and others. Perhaps it's still to early to know what exactly is going to transpire. In a year or so we could see people going to jail. Or we could see the same old activity with a different cast of players. For now we'll just have to stay tuned. Nobody is immune to theft in Laredo. That's why some people put up burglar bars on their windows, buy vicious dogs to protect their property, and install state-of-the-art surveillance systems to keep a close eye on their belongings. Screen grab from today's LMT. So let's get up to speed on some things entertainment, shall we? *25th anniversary of Ferris Bueller's Day Off- How can it be that this movie is 25 years old already? It is still as funny as ever, and many more generations have come to love it. Ferris was one of the top 10 films of 1986, along with the likes of Top Gun, Platoon, and Aliens! "Umm, he's sick. My best friend's sister's boyfriend's brother's girlfriend heard from this guy who knows this kid who's going with a girl who saw Ferris pass out at 31 Flavors last night! I guess it's pretty serious." *30th anniversary of Rush's masterpiece Moving Pictures- This was the album that gave Rush some mainstream radio airplay, with songs like "Tom Sawyer," "Limelight," and "YYZ." It is still the band's most popular album. They recently released the 30th Anniversary Deluxe Edition of Moving Pictures. For about a year now Rush has been on their Time Machine Tour in which they play the album in its entirety! Rush is a band that has truly stood the test of time! Check out their drummer Neil Peart, who was just on The Late Show with David Letterman during Drum Solo Week. *NBA Finals Game 6 tonight- The Dallas Mavericks take their 3-2 lead back to Miami to try and win their first NBA championship. Can they beat the Heat? Although many Spurs fans hate to cheer for the Mavs, I would really like to see Dirk Nowitzki finally get a ring! Good luck to them. *Tony Awards tonight- If basketball's not your thing, maybe you can catch this award show that honors plays and musicals you may never see. But... there will be a lot of star power presenting and performing at the Tony's tonight, so it should be a good show. I want to catch Harry Potter's own Daniel Radcliffe dancing and singing on stage with the cast of How to Succeed in Business Without Really Trying. I also hope to see U2's Bono and The Edge, who should be presenting stars from Spider-Man: Turn Off the Dark. Gotta go get my DVR ready. Have a great Sunday! Update: Dallas Wins!!! Dallas Wins!!! Don't get too excited Cowboys fans. Speaking of the Mavericks of course! The Mavs win their first NBA Championship ever! Congrats to Dirk on winning MVP! "You can't dictate common sense. 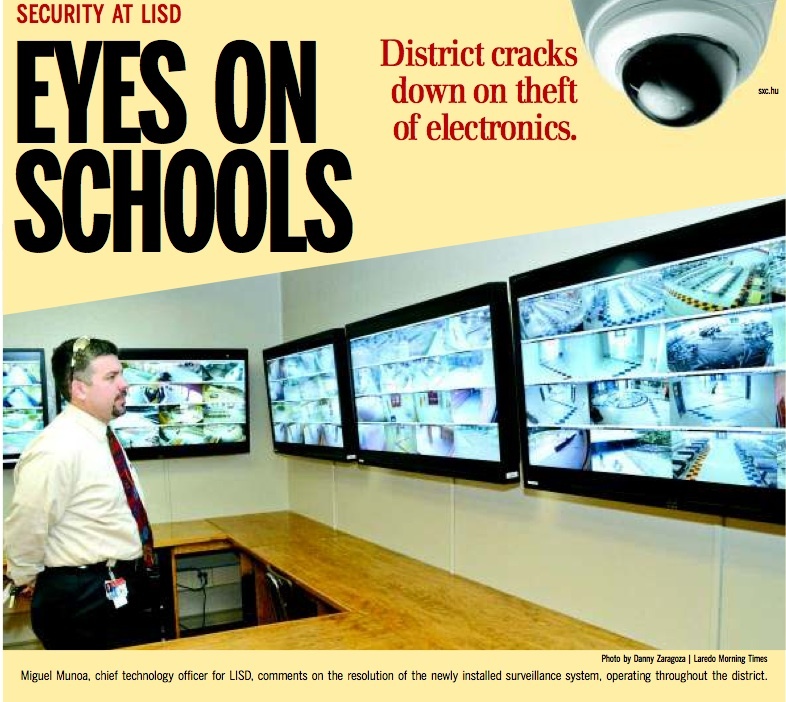 I think this is common sense," Cuellar said. "If you're going to take a picture of yourself and put it out there on the Internet, you're violating common sense." I meant to put up a live stream of the town hall meeting held last night, but I just couldn't get a connection to do so. The UT Health Science Center has WiFi available but you have to have a code to access the internets while there. Anyway, the event was very well attended. But I was disappointed that no local officials went. And by officials I mean the ones who actually vote on issues. The county attorney, and former city manager, Larry Dovalina, were there. Dovalina even went up to the mic to tell of his experience with drillers in the past and the lack of help from the state relating to his land. Gil Bujano, the Railroad Commission representative got an earful from several people. He emphasized to people that if a problem existed with drilling activities, it should be reported to the agency or to our elected officials (who were absent). He acknowledged the fact that the Railroad Commission was understaffed. Gawd bless him for being there to take the heat, but the ones who should've been there to answer our questions are the actual people who are doing the natural gas drilling. I think that as activity increases and it gets closer to our area, people will have to start paying attention. I think there a lot more people who are concerned than those who think there's nothing to worry about. Will try to live-blog from the Safe Fracking Coalition Town Hall Meeting at 6:00 p.m. Reception starts at 5 p.m.
“Travel with Allegiant is a great deal, and we look forward to more deals and more destinations in the future with Allegiant,” said City of Laredo Mayor Raul G. Salinas. 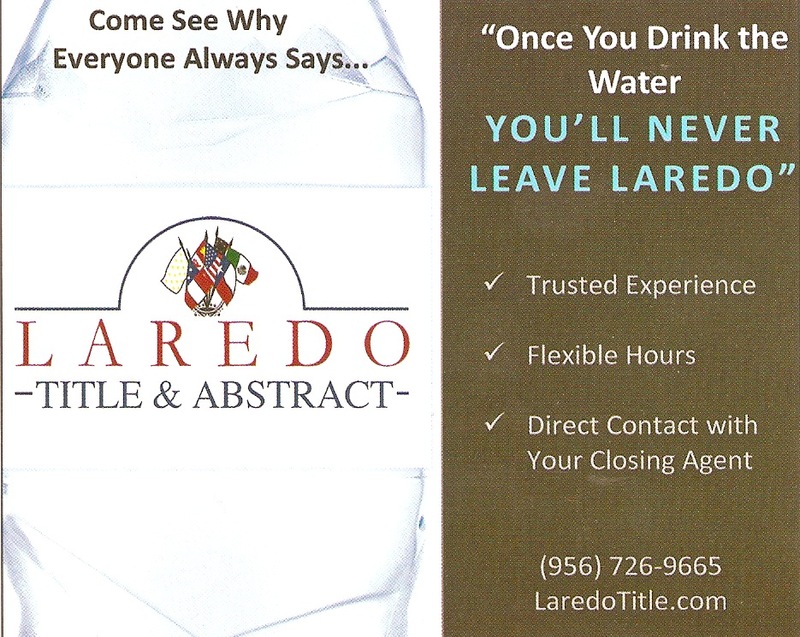 Courtesy of the City of Laredo. 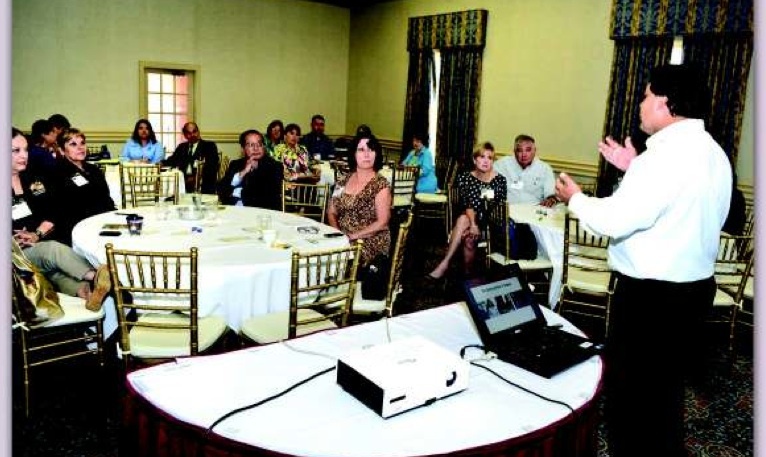 Henry Cuellar wants to train Mexican officials to combat cartels. He cites the success in Columbia. The tactic worked during the war in Colombia, where the situation was worse, he said. If officials were to weed out the corrupt officers from the honest ones in Mexico through extensive background checks and continuous polygraph tests, law enforcement officials on the U.S. side would be able to better communicate with them, he added. So he wants people in Mexico to be vetted through more stringent background checks? OK, that could work (not). But using Columbia as an example may not be the best way to go. I mean, say that the U.S. would be able to rid all Mexican law enforcement agencies of corruption, how would that change the cartels' determination? I'm not suggesting we turn our backs on Mexico, but I don't see how Cuellar's proposal makes a dent in the fight against cartels. The recent confusion over the mayor pro tem (J. Rendon) casting a vote has moved Councilman Garza to come up with a suggestion: change the city ordinance to allow the mayor pro tem to vote. Garza explains that each councilmember is chosen by his/her district's constituents while the mayor is elected at-large (Raul Salinas only votes in the event of a tie). As far as he sees it, each representative should not have to lose the power to vote when serving as mayor pro tem. If one's voting eligibility is taken away, then councilmembers would shy away from filling in for the mayor, he concludes. I don't know that it's ridiculous, but it's worth looking into. My own suggestion is: have a mayor that won't be absent from council meetings. 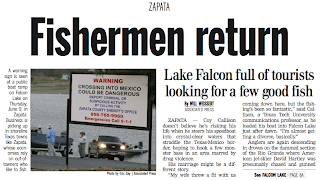 Malfeasance, which mostly goes unreported here, not only happens in Laredo. CORPUS CHRISTI — Corpus Christi Police arrested a city fleet service center employee Tuesday on suspicion of stealing tires from the city and selling them on Craigslist. Some people are just begging to be caught. Rep. Francisco Canseco wants the federal government to have an official meaning of what exactly 'spillover' violence means. 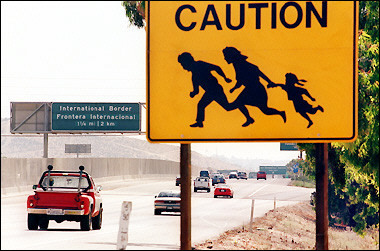 “Violence is spilling over the border from Mexico into the United States and endangering the lives and property of Americans who live along the border, despite the claims made by Homeland Security Secretary Napolitano and President Obama,” said Rep. Francisco Canseco, R-San Antonio. I think we all know what spillover means; I just don't think we have the numbers to prove it. 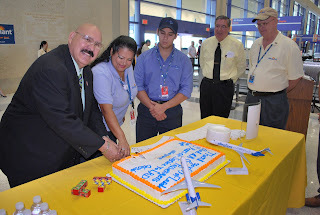 On Wednesday, June 8, 2011, Allegiant will celebrate five years of service to the Laredo International Airport. Mayor Raul G. Salinas will present Allegiant Terminal Manager, Richard “Terry” Schiamara and Allegiant employees with a Certificate of Appreciation on behalf of the City of Laredo. There will be cake and refreshments for those in attendance. In other news, El Manana reports that the number of arrivals and departures are down as compared to last year. Enjoy the cake, folks. Three Webb County Road and Bridge Department employees received notices of termination Thursday for allegedly stealing gasoline from the county after they were caught in a surveillance operation, according to Webb County Attorney Anna Cavazos Ramirez. 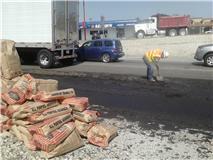 Cavazos Ramirez said her office is still investigating possible instances of fuel theft by the three employees. “Our documentation and our records indicate these people have been doing it for quite some time,” she said. When Larry Barry was looking into discrepancies at the city's street department, he found out that a city gas pump was distributing 15,000 gallons a month, enough "for everyone in Laredo and his grandmother." You know how you can tell it's hot in Laredo? When trucks burst into flames in parking lots. You know how else you can tell it's hot in Laredo? When the mayor wears his cowboy hat inside public buildings. Dan Rather hit the nail on the head when he uttered the words, "hotter than a Laredo parking lot." Check out the trucks that drug cartels are supposedly using to combat authorities. It looks like somebody is taking a page right out of the movie, "The Gauntlet." "I know my American history." That's what she said! "Men stumble over the truth from time to time, but most pick themselves up and hurry off as if nothing happened." Winston Churchill said that, but I would have to double check on Wikipedia. So what happens to women who stumble over or, more accurately, make up their own truth when they don't know the facts? In case you haven't seen Sarah Palin in the news lately, she recently answered a question with her own made-up facts about Paul Revere of American Revolution fame. In the past Palin has been quoted as saying "I wish that basic historical facts wouldn't become political issues." Huh? Then why, pray tell madam, do you bring up history when asked a general question while on YOUR bus tour? Her followers tried to alter the Paul Revere facts on Wikipedia to match the wrong information Palin was blathering on about. The Wikipedia site got so many revisions in one day that it has now locked down that page from further editing for the time being. A similar situation happened before when Katie Couric asked Palin, who was running for Vice-President at the time, to name some Supreme Court cases she was familiar with, and Palin only referred to Roe v. Wade from a previous question. When she gets it wrong, she tends to blame it on the media for giving her "gotcha-type" questions! As Brian Williams of NBC Nightly News states in this video clip, the "shout-out, gotcha question" Palin was asked in Boston when she rambled on about Paul Revere warning the British was the following: "What have you seen so far today, and what are you going to take away from your visit?" Uhh, yeah, that's really putting her on the spot! This afternoon as I made my way through Matamoros St., I saw a cloud of dust around the area where I-35 South meets Victoria. I thought there was some road work being done but I've learned that that's not the case. I've been informed that a truck hauling waste water spilled its load at the site pictured above. This is apparently happening on a regular basis here because the trucks don't have any type of cover to contain the material. And it turns out that this substance, which appears to be some sort of dark sludge, is actually waste material coming from drilling sites in northern Webb County. TxDot staffers and Laredo Police officers were at the scene and they explained that these spills are happening along I-35 and Loop 20. However, nobody was cited this morning because the truck left the scene and nobody was able to identify the company responsible for the mess. So here we have water that's been mixed with chemicals at drilling sites spilling all over our roadways. Energy companies will wash their hands of this; those in charge of hauling this waste will get away with this; and the taxpayers are left to clean up their waste. I would not want to be the one cleaning up that sludge. 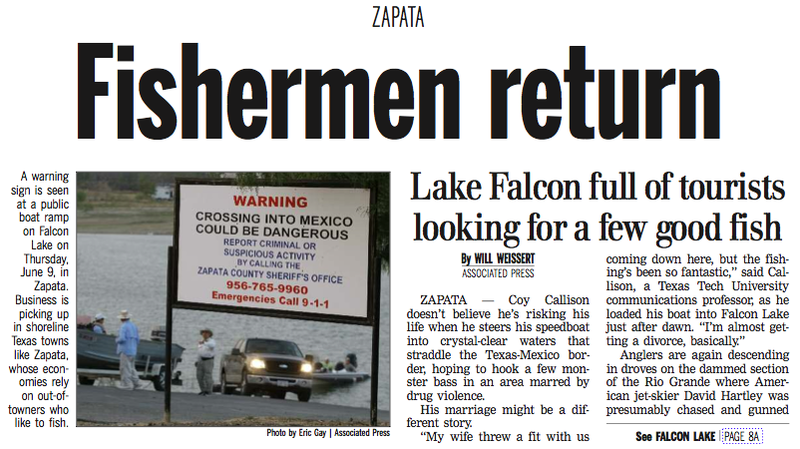 Laredo media and politicians: the ball's in your court. He likes to post by the roadside, and his name is Gil Rocha. But I like to call him the barrio blogger. El Manana reports on a program available in Nuevo Laredo that helps needy residents make their own cinder blocks that will go towards the construction of their own homes. The cost of making a block is one peso each. People interested in the program are required to do all the work and provide their own help and tools as they produce the bricks. A facility manager is on hand for guidance. However, as homes are being built, people have to contend with looters stealing the blocks. Scavengers either use the materials themselves or sell them to those who need 'em. Naturally this activity is also seen at homes that have been abandoned. Those affected have sought help from authorities. Here in Laredo (located north of the Rio Grande), a lot of construction material goes to waste. It is either dumped illegally on private property, or is left to pile up on people's lots. Bricks, cinder blocks, and pieces of wood that could be reclaimed just sit idle throughout the city. Surely there must be someone out there who could use it for something worthwhile. Some time ago I got the crazy idea of buying and selling used bricks. I figured I would put out the call to people in the neighborhood to bring me their unused bricks and I would compensate them with what I would determine appropriate. If I couldn't resell the inventory, then I would have what I needed to build my own brick shed, mailbox, patio, barbecue pit, fence, etc. I pitched this idea to a friend and he imagined junkies stealing bricks from homes to score some cash. 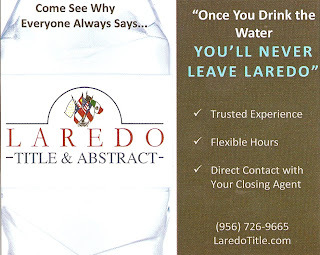 As a result, you would see homes all over Laredo with holes in them. I don't know that thieves would take a pick, or hammer to homes to steal all the bricks they could, but it's certainly something to keep in mind if I decide to take on this business venture of mine. City council met tonight to hash out some issues. One of them was the little matter of Johnny Rendon voting to award a city contract to a law firm while acting as Mayor Pro Tem. Apparently while anyone is filling in for the city's emcee mayor during a meeting, that person cannot cast a vote. People are human, and they make mistakes, but it amazes me that Mr. Rendon has been on the council for a while, and yet, doesn't know that he can't vote while serving as mayor pro tem. I'm hard pressed to think that this issue has never come up during a meeting before. LISD and UISD students have the rest of the summer to recharge before hitting the books again in September. For those fortunate enough to have financial backing, they can partake in one of the numerous summer camps available. If you're lucky you can find a free one too. Low brass students can get ahead of the competition by participating in the VMT Low Brass All State Preparation Camp beginning today. The camp runs through June 30, and is free. Taught by John Reimund, low brass instructor at the Vidal M. Trevino School of Communications and Fine Arts, the camp will run Mondays through Thursdays from 2 to 5 p.m.
A typical day will include breathing gym; pedagogy and warm up; sightreading and group lessons, using all state music examples; and private lessions. "We’ll have a mock audition every Thursday," Reimund said. "Come and be a part of the leanring and low brass fun, and really get prepared for the new Texas All State Band auditions." For more information contact Reimund at 795-3325, or via email at jreimund@elisd.org. Earlier this year we featured two Nixon students that owed their success to Mr. John Reimund. LaSanbe hopes this summer camp produces more All-State band members next year. Congrats to KeyRose who has started his summer movie watching, in 3D no less. Even though we are a couple of weeks away from the first official day of Summer, the movie blockbusters are well underway. The flicks that are already out there include: Thor, Bridesmaids, Pirates of the Caribbean: On Stranger Tides, Kung Fu Panda 2, The Hangover 2, and X-Men: First Class. Coming this Friday is Judy Moody and the Not Bummer Summer and MY most anticipated must-see film: Super 8. By all means get comfortable. 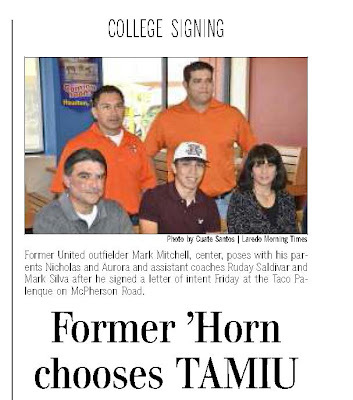 Photo courtesy of the LMT Business Journal. The reason I payed the extra cash for the 3D version had more to do with our available free time than anything else. We could've made one of the earlier showings and paid matinee prices but I just didn't manage my time well enough. Nevertheless I was surprised by the experience. And what I mean by that is that it was a comfortable viewing. It almost felt like a private screening. The movie's 3D effects were decent; they were actually more impressive during the previews. I don't know if I'll pay 3D prices again, even though my son insists that we check out the new Transformers movie in this format at the end of this month. I may do it for the relaxed atmosphere of it all and not the hyped-up graphics. Kudos to the people who have taken the initiative of caring for their environment in the area just south of Laredo Community College downtown. They have had limited options in terms of green spaces until now. But now it looks like more people will learn of what the neighborhood has to offer. Editorial submission concerning the downtown revitalization project. City administrators have been in negotiations with TxDOT this past year to orchestrate the trade of the five blocks of green spaces leading from IH-35 to Bridge II. The regional TxDOT engineer has said that because TxDOT can only sell or trade the land, the City of Laredo has negotiated a trade of the TxDOT-owned green spaces for land at the World Trade Bridge. City administrators say that the City will get two parcels of the green spaces in exchange for the maintenance of the balance of the green spaces because TxDOT no longer wants to carry the burden of maintenance. 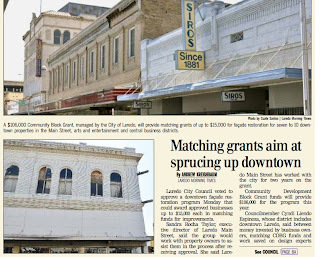 The City Manager stated in the May 2011 issue of LareDOS that developing these blocks will provide a way to bring additional revenues to the City coffers. 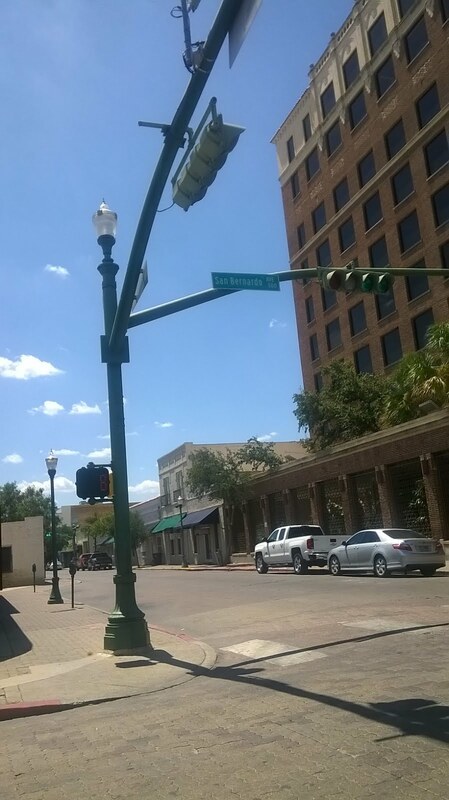 The plan, according to them, is to fill the blocks with a City mall filled with lease spaces and other buildings the City of Laredo will rent and maintain. The first project is a City-owned commercial mall piggybacked onto the Federal bus passenger inspection station. 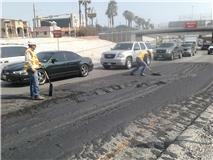 It is the intention of the City to close Hidalgo Street to traffic. (You can see the entire mall plan at www.laredosnews.com) The Federal station calls for a 10 to 15,000-square-foot space, but nowhere in the GSA solicitation does it make mention of the need for retail lease spaces. The City’s choice to be involved in this federal project is not a public necessity. This project requires the design of an approximately 10,0 00SF to 15,000 SF bus and bus passenger processing facility at the Lincoln-Juarez LPOE. As a minimum, this facility is to include a luggage x-ray and inspection area; I-94 processing area and permit counters; waiting area; detention area; area(s) for federal and state inspection agencies; restrooms (public and staff); pedestrian inspection lanes; individual bus stalls (primary and secondary); non invasive inspection area; and canopy for loading and unloading. 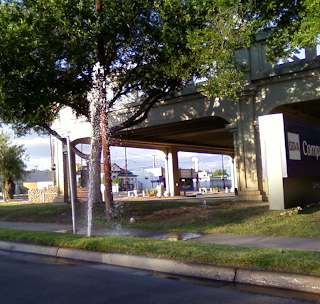 Before the City-TxDOT trade of land negotiations began, the bus inspection terminal was to be built on the east side of Bridge II on federally owned land. City management has made it clear why they want those blocks of green space land. They want to build a lease mall to generate revenues. But where and when were the public meetings for those who have a stake in downtown or in downtown neighborhoods such as the Azteca, the San Agustin Historical District, and the St. Peters Historical District — those who would most adversely be affected by the location of the project. Where and when was the public meeting that allowed the business community a review and comment of the business plan that the City believes will be a revenue generator. Neither the efficacy of the business plan for the City to become a landlord nor the site of the mall’s location have had public vetting. Today, after the northbound Mexican bus passengers are inspected and processed, they frequent neighboring money exchanges, restaurants, and convenience stores in the area surrounding Bridge II. The private sector businesses that service these passengers will have to compete with the City lease mall. According to one of these business owners, however, the City administrators have promised that they will be allowed to lease in the new City-operated building. They should be aware that it is easy to promise over 100% of coveted space to competitors, but some of them will be turned away. Assuredly, the City’s revenue generating business plan does not have a line item in the revenue loss column for the loss to the City of property tax revenues due to the probability of business closures because they have found a new address in a tax exempt City-owned mall. Considering the revenue loss column further, is there a line item for the maintenance and repair of the mall, or will no cost be attributed because the City will just roll it into department tasks for City-owned buildings. The proposed retail mall’s common areas will take City employee time and expenditures for labor and purchases of materials. Is there a line item for utilities, or will no cost be attributed because utilities for City-owned buildings are paid by their department budget. Water, sewer, garbage pick-up, and electricity are still an expense even though they fall under the umbrella of the City. How about the expense for the maintenance of the balance of the three blocks that the city has reportedly agreed to in order to make this project possible? If many of the revenue loss line items are missing, how true and correct is it that this commercial mall addition to the federal bus station is revenue generating? The City’s choice for their new mall location will impact access to downtown, which equals another revenue loss missing from the calculations of profitability. Santa Ursula and San Dario, the two major thoroughfares in the approach to Bridge II, form a boulevard that leads traffic to and from the international bridge. The strip of planted ground of the boulevard bounded by San Dario, Santa Ursula and five important east-west intersections is the land that the City administrators eye as valuable real estate. This public land which serves the purpose of attenuating traffic is in a highly congested area. Access is what makes property valuable. Impeding or constricting access lowers property values. Impeding access to downtown and making it more difficult to shop there will lower sales tax recapture. The City’s project closes Hidalgo Street, a traffic-impeding choice for both for through traffic from south Laredo and destination traffic to downtown. 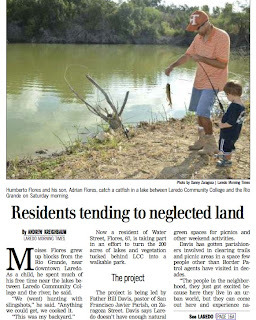 The closure would have a catastrophic effect on the already depressed values of the Azteca neighborhood and it would make access to downtown and City and Webb County offices even more difficult for its residents. The City’s project fills the strip of land between Santa Ursula and San Dario with a high security bus station, a commercial mall, and proposed other City or federal buildings. The additional traffic will completely congest already heavily transited thoroughfares with busses trying to queue to the highway from Farragut Street. Cars attempting to go into and out of parking lots to the new buildings would invite gridlock to an already congested area. It will further exacerbate the virtual shut-down of traffic movement when the train blocks all access to public streets and the only way to join the gridlock is from the underpass on the highway. Construction of a City retail mall in this five-block area will close and re-route traffic for two years or more. The lack of access during construction alone maybe enough to close down many sections of downtown for years, impede property sales downtown and in the St. Peter’s District, and sway students away from LCC West. Property owners will not have much to look forward to after construction because none of the work was done to make it easier to arrive, but only more difficult. Vacant properties mean lower property values and loss of property tax revenues for the City. These lost revenues need to be reflected in the City’s business plan for this project. The City administrators, when judging if their project is an economic generator for the city, must make a true and real accounting as to the real cost of the project. It must include all expenditures and not rely on City departments to pick up the tab. It must consider the loss of revenue the plan may generate. Then you have to ask how much rent will people be willing to pay to make this a revenue-generating project. Or do we have to consider the possibility that this project is a sweetheart deal for people that City officials favor. Perhaps revenue generation is just an excuse. Perhaps some time should be spent on finding out who is actually involved in the development of this project and what work has been paid for. 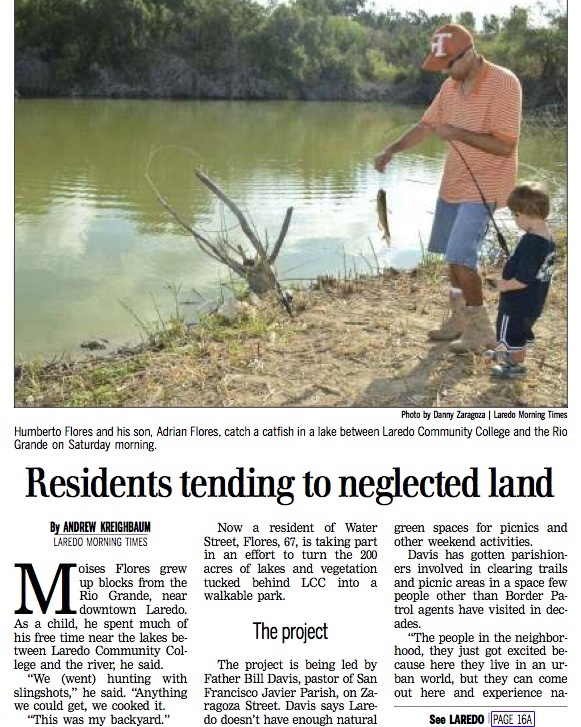 Judging by the public meeting hosted on May 6 by Council member Cindy Liendo Espinoza and by what was printed in LareDOS, the Kell-Muñoz downtown master plan architects have spent time working on projects other than revitalization. How much of what they were they paid went to develop plans for the bus inspection station and City lease mall project? 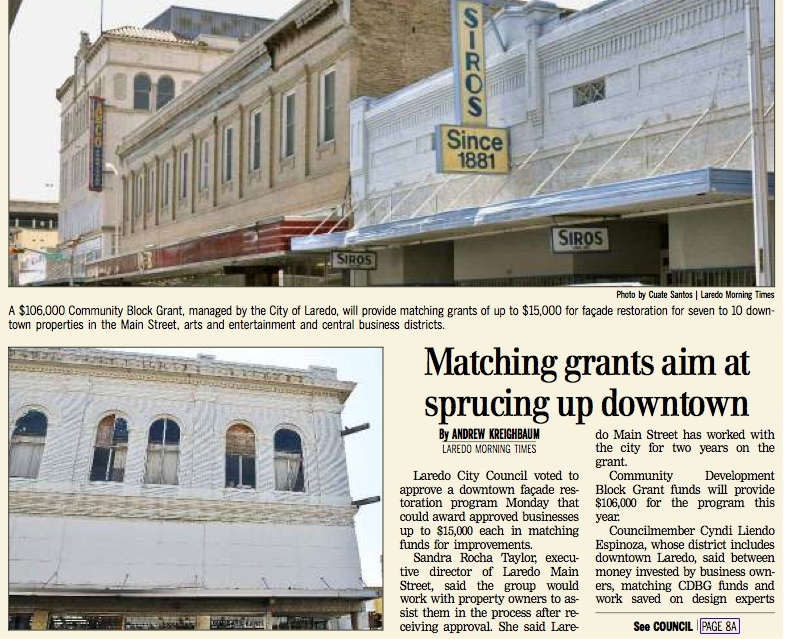 Whatever the amount was, it was money taken from taxpayers and the downtown business and property owners who expected a revitalization plan for downtown, not for new retail space owned by the City of Laredo.